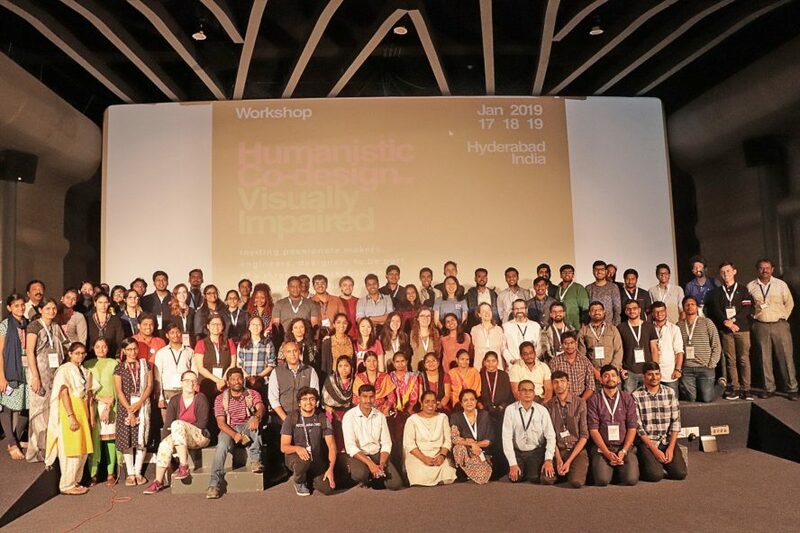 LVPEI Center for Innovation and MIT (Massachusetts) in sponsorship from MIT-India (Massachusetts) and LV Prasad Eye Institute (Hyderabad) hosted a three-day workshop on Humanistic Co-Design for the Visually Impaired in Hyderabad. This was an ideal platform for design and engineering students to directly collaborate with people who have visual disabilities, examine their problems and identify solutions. This tour was part of the annual MIT India programme by the MIT (Massachusetts) team to a few Institutes in India to understand disability needs and Co-design. Humanistic Co-design nurtures the thought of including the motivations of the user while building solutions for them. The process begins through holistic connections with people without a design/engineering agenda and concrete designs reveal themselves through intrinsic humanity and the desire to be of service. “The LVPEI Center for Innovation has been home to many innovations in the areas of eye care delivery, biology of the eye, surgical techniques, eye banking and children’s eye health among others over the years. LVPEI provided a platform for young minds to see their innovations from prototype to product through this workshop, and we saw an amazing range of possibilities,” said Raghu Gullapalli, Executive Director, Emerging Technologies and Business Development, LVPEI Center for Innovation. During this workshop, participants worked with focus groups, rehabilitation experts and professionals from various domains to ideate and rapid prototype. The participants were mentored by Dr Kyle Keane, Lecturer and Research Scientist from MIT, who specialises in computational materials science, human-centered design, and engineering technology that helps people with disabilities, along with Dr Beula Christy, Head of Centre for Rehabilitation of the Blind and Visually Impaired at LVPEI. The Humanistic Co-design Initiative is a cooperative of individuals, organisations and institutions working together to increase awareness about how designers, makers, and engineers can apply their skills in collaboration with people who have disabilities through the Humanistic Co-design Process to develop new and innovative assistive technologies. The workshop was co mentored by the other MIT faculty and team from LVPEI Center for Innovation.